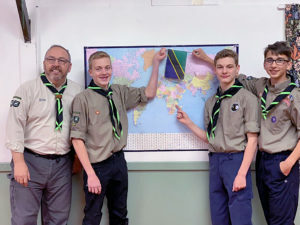 Three local Explorer Scouts and their group Scout leader, John Lister, are embarking on an African adventure to support community projects in remote, rural areas of Tanzania. They have been selected to be part of a four-week expedition organised by Hampshire Scouts in the summer of 2020, which will aim to complete four separate construction projects. The three boys from the 1st Broughton Gifford and Holt group will be helping to build teacher accommodation at a school in Madabadaba, in the southern uplands, near the town of Ifakara, while John will be helping to lead a project working on a new medical centre in Emau Hill, one day’s drive north from Dar es Salaam. Each of them needs to raise around £3,500 between now and next summer, to pay for their expedition costs and to contribute towards the building costs of the projects themselves, so they will be fundraising in earnest. “I’d like to try to do a 24-hour bike ride to raise money and to raise awareness of what we’re doing,” says Will Lister (14), whilst the fourth member of the team, Olly Saunders (15), has been building birdboxes and selling them and is also planning an endurance 60k kayak, cycle and run in the summer. The whole team is excited about meeting the local people in Tanzania, working alongside them and experiencing their culture, food and living conditions. Picture: John Lister, Olly Saunders, Will King and Will Lister.